Earlier this year, the cashed up and extremely patient Red Emperor Resources (ASX: RMP) acquired some of the most prospective oil and gas acreage on Alaska’s renowned North Slope and in a matter of months the dual-listed junior will test a potential company making, 400-million-barrel target. Despite having produced over 17 Billion barrels (Bbbls) of oil to date, an estimated 40Bbbls of undiscovered recoverable conventional oil still remains on the prolific North Slope and its recent renaissance is being led by some of the world’s biggest energy companies. 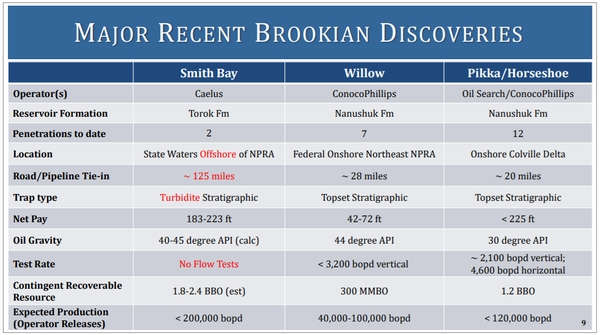 Old warhorses Prudhoe Bay & Kuparuk River are still producing, having pumped out over 15 billion barrels of oil since 1977, but it is recent discoveries made by the likes of Armstrong, Repsol and ConocoPhillips that have RMP feeling confident. Franking this belief was the entry earlier this year by Australian blue-chip energy company, Oil Search, which completed its own US$850 million acquisition of nearby acreage including one of the largest conventional oil discoveries in the last 30 years. The play, referred to as the ‘Nanushuk oil fairway’ could be as big as 3 billion barrels and a good portion of that oil lies immediately adjacent to RMP’s blocks. RMP is targeting the same sands and formation as this recent discovery, less than 3 miles away. Oil Search has also mapped two further Nanushuk trends abutting the southern boundary of RMP’s blocks and one to the east and is planning further exploration. 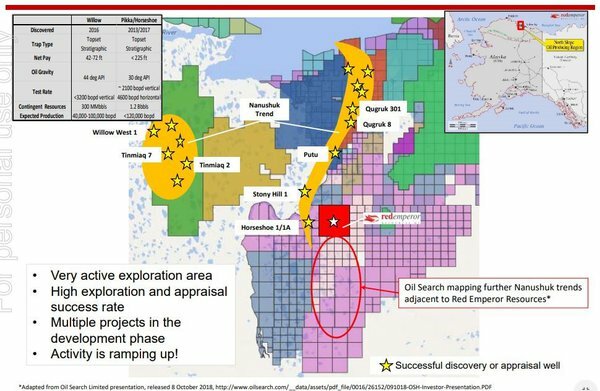 Suffice to say, RMP is smack bang in the middle of recently discovered oil and potential extensions, so the real estate could not be better as you can see by the map below. RMP is situated among significant oil discoveries. As alluded to above, other major players in the region include oil and gas powerhouse ENI, BP, ExxonMobil and ConocoPhillips. 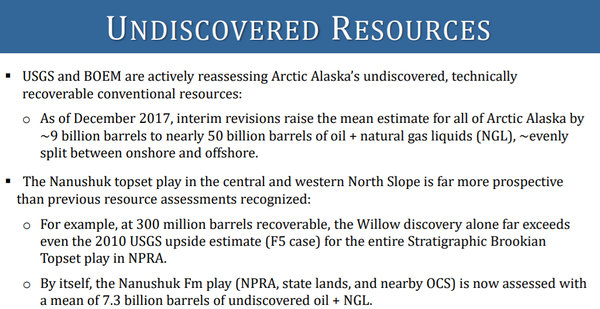 Conoco is Alaska’s largest oil producer and, building on its previous success at Willow, recently discovered up to 750 million barrels of oil equivalent (MMBOE) in the Greater Willow Area during its latest exploration and appraisal campaign, further increasing its resource. Conoco has also drilled three wells in between Pikka and Horseshoe, with all of them successful and resulting in the recent Narwhal discovery of 100-350MMBOE. Red Emperor Resources, which is also listed on the Alternative Investment Market (AIM: RMP) in London, is hoping for similar success to the abovementioned players with its potentially transformative North Slope claim. RMP plans to drill its well (to be named Winx-1) in February and is targeting an estimated prospective resource volume of 400MMBO. As mentioned, the drill target is immediately adjacent to, and a direct analogue of, the successful Horseshoe 1/1A oil well (shown in the map below). Given RMP’s modest market capitalisation of approximately $20 million, the potential value of its share of a 400 MMBO well implies substantial share price upside. RMP has several potential catalysts to come in the near term and we expect these to provide a significant re-rating of their share price. So, with that in mind, let’s take a deeper look at the coming catalyst. RMP, along with partners 88 Energy Limited (ASX: 88E) and Otto Energy Ltd (ASX: OEL), has met with the Alaska Department of Natural Resources to expedite the required approvals and permits to drill the Winx-1 prospect, the initial exploration well on these highly prospective Western Blocks. 88E is a proven operator on the North Slope and RMP is in safe hands with them leading the operations. All aspects of the permitting process are on track and a rig contract with the highly-regarded Nordic-Calista has been signed. It is simply a matter now of waiting for winter (drilling season) to come. Its close proximity to proven wells is shown below. RMP is now waiting for drilling season to commence. RMP has a low cost well and will test for a large prospective target. Note the proximity of RMP’s acreage to those of Oil Search’s mapped Nanushuk trends (above). Now, consider that this well is estimated to cost approximately US$15 million (100% dry hole cost) of which RMP’s share will be just US$5.25 million. It is quite unique for companies to have the opportunity to test such a large and prospectively valuable target for such a small investment. The cost of exploration in this proven and developed region is far more reasonable than other areas of the world, particularly in comparison to similar sized targets. For example, shares in Carnarvon Resources (ASX: CVN) soared in July/August due to the success of the Dorado-1 oil discovery, although the cost of that well was $100 million. The size of that prize was 150MMBls (30MMBbls net to CVN) yet success boosted their market cap by over $250m. RMP is poised to test a 400MMBO target (106MMBls net to RMP after royalties) for US$5.25 million. Depending on how one chooses to value a discovered barrel of shallow, conventional, light oil that is close to infrastructure and development, it could potentially be worth $5-10 a barrel to RMP. RMP expect to be drilling by mid-February, but how has it come to be that this consortium has exposure to one of the most prolific oil producing areas in the world? The answer to that might sound simple, but being astute, well-funded and nimble were the main factors. The consortium was presented with an opportunity from a distressed seller and it is unlikely that any major oil company or consortium could have transacted so efficiently given the very short lead time that was presented. The vendor, Great Bear Petroleum, was forced to deal on their jewel in the crown due to burdening debt, a cash commitment to the Alaskan government and an obligation to drill a well within a year or face losing the blocks. In stepped RMP, 88 Energy and Otto Energy Ltd, with all its ducks in a row: right place, right time, consequence of fate, a strong cash position (fully funded) and a high functioning board. RMP’s board, which has been the beneficiary of a new CEO with plenty of experience around big discoveries, moved quickly as it recognised the huge potential of the area and the freedom to operate in a region unconstrained by bureaucratic hurdles. With Definitive Agreements executed, the focus will now be on drilling a highly prospective Nanushuk oil trend exploration well. RMP has a sizeable stake in the joint venture as indicated below. The size of RMP's stake is considerable compared with its partners. As highlighted previously, Horseshoe is part of the recently discovered multi-billion-barrel Nanushuk oil play-fairway, one of the largest conventional oil discoveries in the US in more than 30 years. How did it come about? Well the answer is Bill Armstrong and his private company, Armstrong Oil & Gas. After discovering some 750MMBls on the North Slope between 2001 and 2005, Bill Armstrong returned to Alaska in 2009. Believing that there was still a huge amount of undiscovered oil remaining on the North Slope, he began acquiring leases that exhibited a key set of technical features and assembled a portfolio of significant size. What happened after that was truly remarkable as from 2011 to 2016, the Armstrong-Repsol JV drilled 19 wells for 19 successful discoveries. A 100% success rate! This area is now known as the Pikka Unit and most likely contains over 500 mmbbls alone. Not wishing to rest on their laurels, however, they decided to step-out some 21 miles to the south and drill the Horseshoe well. Bang! They were in the same sands and the same oil. They had just proven an enormous oil ‘fairway’ and one which had almost every major knocking on their door. Enter Oil Search and the rest is history. Red Emperor and its consortium partners are now part of this emerging new play. With that in mind, this is what is on offer for RMP and its partners on the North Slope. 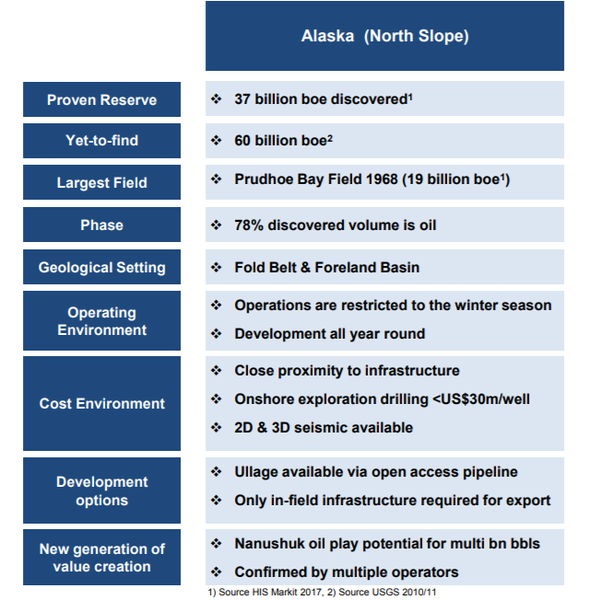 The North Slope holds significant advantages for RMP. The North Slope is historically one of the most prolific oil producing areas in the world with rich and prolific source rocks. The host Nanushuk sands are shallow, regular rock with good porosity and permeability. The oil is of premium quality being high gravity, sweet oil with no gas. Appraisal drilling recently carried out by Conoco at the Putu 2 well has delivered strong results with the well successfully encountering oil, with slightly better reservoir properties than expected. Here’s a look at the progress being made by Conoco and Oil Search. ConocoPhillips has set records in the area. Consequently, indications are that there is potential resource upside within the Pikka Unit from Oil Search’s current estimates of 500 million barrels (gross) of 2C contingent oil resource. This and ConocoPhillips’ successful Stony Hill exploration well, located close to the company’s Horseshoe discovery, also highlight that there is material exploration and appraisal upside in the lease areas, including the Horseshoe Block. Oil Search’s next major milestone in Alaska is the 2018/19 drilling program, which should see the group commence the development of the Pikka oil field in mid-2019. The company is of the view that there is the potential to increase 2C resources from 500 million barrels to more than 720 million barrels following the drilling of 2019 appraisal wells. Combined with the Horseshoe discovery this could potentially delineate a 3 billion barrel field. 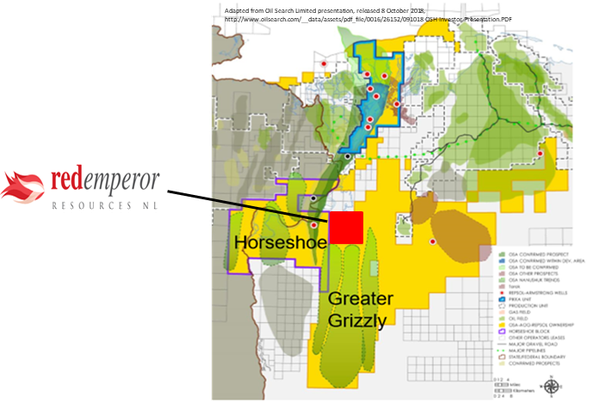 Encouragingly, Paul Decker recently indicated RMP has a home-ground advantage in the particular region it has targeted, saying, “Of the recent discoveries, the greatest promise is from proving up the basal Nanushuk topset play”. Results from Oil Search’s drilling program have the potential to provide share price momentum for RMP. From OSH’s perspective, these are the key factors that underpinned the company’s decision to enter the region, and more specifically launch an aggressive exploration campaign. As RMP is targeting the adjacent area, the same boxes can be ticked in terms of weighing up the value of its acreage and exploration prospects. Just as recent success from the major players has generated interest in the region and provided significant share price momentum for other companies in close proximity to discoveries and/or proven oil fields, similar news is expected to emerge in the upcoming drilling season. ConocoPhillips has provided an update on its operating plan for Alaska, focusing on the company’s long history of creating value in the state and an ongoing commitment to investing in low cost of supply opportunities. The group captured a net resource of 2 billion barrels of oil equivalent at less than US$40 per barrel cost of supply resource in its legacy assets, further highlighting RMP’s emphasis on the comparatively cheap cost of exploration and production. Importantly, ConocoPhillips emphasised the potential upside of the Greater Willow Area. Having estimated its 2016-2018 exploration and appraisal campaign discovered up to 750 million mmboe of gross resource, with undrilled resource upside, management believes this resource estimate is sufficient to justify developing the area with a stand-alone hub. Discoveries in the region have ranged far and wide and auger well for RMP's program. At this stage, Conoco Phillips estimates first oil can be achieved by 2024-2025 for an investment of between US$2 billion and US$3 billion spent over the course of four to five years after final investment decision. Once first oil is achieved, the company anticipates ramping quickly to full production. Thereafter, management estimates that a similar level of cumulative drilling will be executed over multiple years to maintain production at this facility. Consequently, there should be plenty of news from the group’s upcoming drilling campaign. 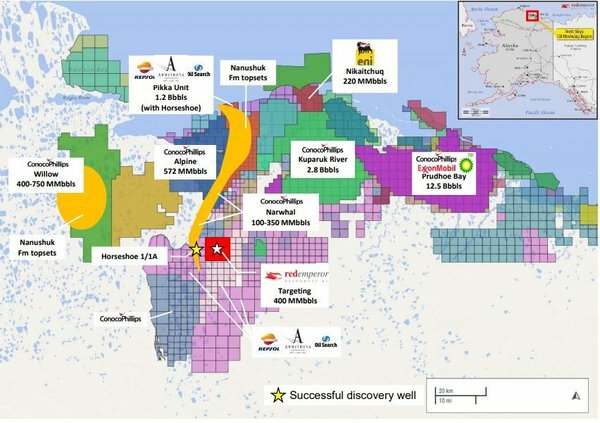 Importantly, the more success that ConocoPhillips and the other multinationals in the area have, the better it is for RMP as this would normally drive up the value of the nearby acreage, even to the point where it becomes strategically attractive for one of the major players to expand its position. One could say that RMP has the playbook – it now has to come up with the game changing plays that could redefine the company.